In the documentary Sir Terry Pratchett witnesses the death of a man who chose to die by assisted suicide. A documentary about fantasy writer Sir Terry Pratchett's quest to examine whether assisted suicide is the right decision for him as he battles Alzheimer's has sparked widespread debate online about the controversial issue and how it was portrayed. 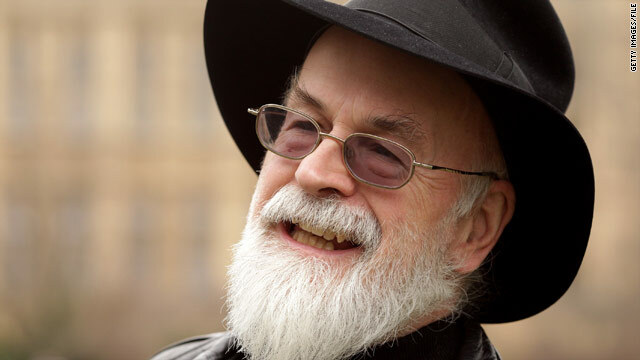 The documentary, called "Terry Pratchett: Choosing to Die" has been described as "harrowing," "disgraceful" "powerful," a romanticizing of a "conveyor belt towards death," "heartbreaking" and a "slippery moral slope." The words, of course, depend on what side of the issue you fall. Still, by most accounts, the documentary aired by the BBC in the U.K. was raw, real and intense. And so are the reactions to it - particularly regarding a scene towards the end of the film in which hotel owner and millionaire Peter Smedley, who suffers from motor neuron disease, ends his own life. The film shows Smedley, after consulting with his family, making the decision that he will end his life. In a blue house in Switzerland, with his wife by his side and the help of the Swiss group Dignitas, he says his final goodbyes, drinks two drug concoctions, and quickly goes into a deep sleep, snoring, before he stops breathing. Most who watched the show knew they were going to see a man die - it had been publicized. "No one was going to be tuning in expecting a barrel of laughs," Metro U.K. staffer Keith Watson wrote. "We were about to watch a man die." It is not the first time a documentary on assisted suicide showed someone being helped to take their own life. Sky, in the U.K. and HBO in the U.S. have aired or currently are airing similar documentaries. But the BBC documentary, whether because it features a prominent person in Pratchett, or because of its raw tone, has hit a nerve for many people. The documentary's director, who traveled with Pratchett and has been documenting his journey, said he knew the topic was going to be controversial. "We knew that if we wanted this film to be entirely honest about assisted dying then it was important to show the whole process, including the death itself," director Charlie Russell wrote in a blog on the BBC website. "When Peter, the man who dies on-camera in the film, agreed to let us record his end, the challenge was to film it respectfully, sensitively, but most of all truthfully." "We don't romanticize it - there could be no fade to black before he drank the poison. It is up to you to decide whether his last moments are deeply moving, distressing, or rather ordinary. I suspect it is a little bit of each of these and, depending on your own family's experiences, so much more." The BBC said they received nearly 900 complaints about the documentary from people in the U.K. The documentary cannot be viewed online in the U.S., but perhaps the biggest debate is raging online - where columnists, lawmakers, groups and regular people are weighing in to blast or cheer the BBC's work. Baroness Finlay of Llandaf, one of the U.K.'s leading opponents of legalizing assisted suicide, told the South Wales Echo that the documentary showcased Smedley's death as if "he was on a conveyor belt." She found the documentary "worrying" because of how it injected itself into a major legislative debate. Assisted suicide is illegal in U.K. but legal in Switzerland. "A change in the law would, for the first time in this country, legalize killing people," she told the South Wales Echo. "When you change the law you don’t just change it for a small number of very clear-minded people, but you remove protection for lots of people who are very vulnerable, who can easily be made to feel a burden by their families and the care system." On Twitter, many of those who watched the documentary praised it. Some said it was moving for showing the human side of terminal illnesses and the decisions families must make about how to move forward. A quick search on Twitter shows dramatic responses: That people had sobbed while watching it, been enraged about how it was handled. Some said they felt that everyone should have to watch it before they ever debated the issue again. For others, the show was a shocking and disturbing display. Nola Leach, CEO of the Christian social-policy charity CARE, was one of those people. “I rather thought that we had moved on from the days when people gathered in crowds to watch other people die," Leach told the Christian Post. "That the BBC should facilitate this is deeply disturbing. One wonders whether the BBC has any interest in treating this subject impartially." Even in the U.S., where physicians in Montana, Oregon and Washington can aid in assisted suicide, reaction was strong. Chris Hampson, the Director of Foreign News for NBC, wrote for MSNBC about his experience watching the documentary. "I watched a man die on television last night. Not in some Hollywood crime mini-series, but for real." Hampson, as many journalists have, said he has been around people who were about to die, or had died, but that this was different. "This was the first time I’d been witness to the moment when a person passes from life to death," he wrote. "That it was by choice, made it even harder to watch. I admit to tears rolling down my face." It's clear the documentary has brought about a debate and public discussion of the issue and life. "Choosing to die" misses the depth of life‎, a Guardian column proclaimed. The movie raises key questions about how a society handles death: Does a person have the right to die when they wish to do so? And should they be able to enlist someone else to help them? For Pratchett - the answer is still unclear. He doesn't know if he wants to die that way. For him, the film was a way to show his frustration that he doesn't even have the option in the U.K. He also said he was "moved" by the death that was aired on TV - and the documentary only affirmed his support for assisted suicide. "The incongruity of the situation overtakes you," he told NPR. " A man has died - that's a bad thing; but he wanted to die - that's a good thing." It's my life. I get to make the choices that I choose to make. Only an ego chooses to believe in labeling right, wrong, moral, immoral, evil et al. Non-attachment to these labels allows one to make choices for oneself, not for others. If I determine that someone else is suffering than I am projecting that story upon them. Instead, I choose to own my own feeling e.g. I am suffering as I watch someone I love who I "believe" is suffering. I choose to question the thoughts rather than making up stories about it. Past and future are stories. Only the present moment has experential reality. In summary, I get to choose how and when I die. If I choose suicide, that is my right. Our individual fear of death is what this debate is truly reviewing. I am so honored to live and be in the USA. We are trying to enculturate and assimilate so many cultures, beliefs, religions, races...and we are still young in our civilization. Actually we are pretty uncivilized and barbaric in many areas of our lives. Wars. Oh my. We send our children to commit suicide for what? Yes, they are killed by others so the definition of suicide may not apply per se...and yet, isn't it suicide to send them into war zones? This is a huge subject. My request. Let me choose for my life or for the end of my life. After all, it is mine. And as long as I don't cause harm to another, I believe I can opt for suicide as one way to die. Karenbeth while I agree with most of what you have to say, I strongly disagree with you about "sending our children to commit suicide" If this is what you think serving in the Armed Forces during war time means then you must have been watching too much TV. I am a soldier because I choose to be period. No one is promised to see tommorrow. Ten times more people die in car crashes than in combat. Like I said some of your points are valid but don't risk ruining that by talking foolish about servicemembers. I disagree with the use of the word suicide. These are not healthy people that are ending their life. These people are suffering through terrible ordeals/diseases with constant pain and no hope of getting better, only of getting worse. If you live with pain on a daily basis, getting worse as it goes along, what is the point of living. Yes, you do take your life with the help of a trained professional. Don't we do this for our animal companions when their quality of life is no longer pleasant. I've had to do it with a few of my animals. Why don't humans have that choice? Because the drug companies won't be able to continue getting rich off the sick person by selling them pain meds. Why do you disagree with the word "suicide"? The word comes from latin "sui" (someone self) and "caedere" (kill) – so kill your self. It is a description of what is happening. The fact that you are ill or healthy isn't changing the fact that you somebody is killing himself – ergo "suicide." I agree with you Francine about not defining it as suicide, and even go a little further- I don't believe it should even really be seen as physician assisted. In most of the states and nations that have legalized this practice, the only participation a physician has is prescribing the medication and watching as the terminally ill patient administers the medication his or herself. There is no slippery slope argument- physician assited suicide was legalized in Switzerland in 1941 and it essentially has not changed at all. People use excuses such as the "slippery slope" to make others who are uneducated on this issue cringe and fear for their loved ones. That is just flat out not the case however. I have never had a loved one choose to end their life before illness took it from them. But this is simply because none of my loved ones have lived in a place that gave them that choice. I certainly wish that many of my loved ones who have passed did have the choice, because as their minds and bodies deteriorate and they began to suffer more and more, it was just agonizing to witness. @Konstantin- the way the term "suicide" is used today, especially in the U.S., is not the same as the two Latin words that were used to form "suicide". That is why Francine and I disagree with phrasing it that way. Get a life "Dano" and go read your bible. The bible also talks about revenge, murder, lying, adultery, etc. And what's your point? definitely fully support the opinion that a sane person should have the option of assisted suicide , if facing terminal illness, and acute suffering and pain. As for the negative aspects, every law when introduced, has its own flaws. But the bright side should not be ignored. Wonder why quality of death is not given as much importance as quality of life !! I`ve seen cancer take the last breath(really last breath) out of two people in my life. I do not want to go out like that myself. I will go out when I`ve had enough & am ready. For the people who think this is wrong...Ohhh Noooo you shouldn`t do that it`s not right. You are all idiots to me! You think living to the last breath in pain throughout your body and yellow in color is noble? This is gods plan? You can go to hell for putting people through this! I am a Ugandan by nationality –Florence Nakimera; I write this message to inform the world about the mistreatment of gay people in Uganda. I secretly leaved as a gay since my childhood in boarding school. But in 2009 my life changed forever when I was arrested, detained and tortured by undercover secret police accusing me of being gay. To this day I do not understand how another person (Uganda’s MP – David Bahati and other government officials) could dictate how I live my life. I request the people of Uganda with the help of the world to stand up against the mistreatment of gay people in Uganda. Hey we r discussing abt self assisted suicide, not the freakin' gay rights, even ugandian undercover mistreated and Invade ur right of how u live . I wish we had a set of beliefs & traditions that we treated death as a matter of celebration & not tragedy & not shedding tears & feeling sadness for the person is relieved from all the worldy pains & miseries as I heard they do in Mongolia. I think we as humans have created a lot of miseries for ourselves for no external pressures or fault of nature. How about the people who are sick and WANT to live? IF you don't have insurance, good luck with that. One local hosptial just did surgery and then let the patient go and told them they need Chemo, and "Bye bye"
Wouldn't it be nice if we could LIVE a GOOD LIFE and DIE with love and loved ones around us when it is over? We will ALL DIE. ALL of us. The argument is just about who gets to choose how and when.